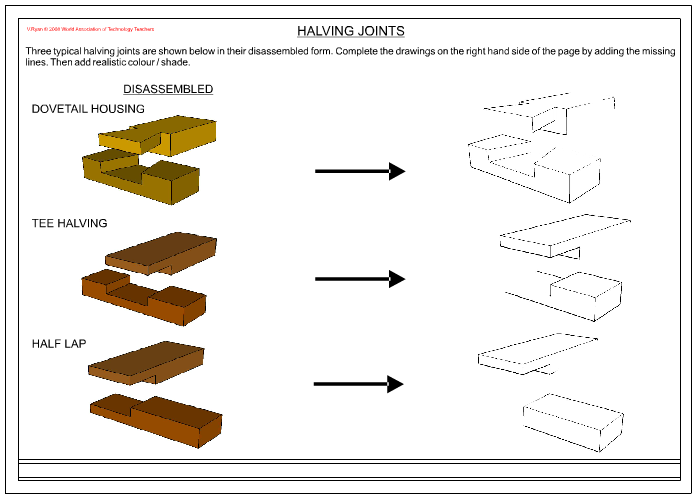 A range of halving joints exist to suit different designs. For instance, the dovetail halving joint shown below can be used where great strength is required. A joint such as this is very difficult to pull apart because of the dovetail shape of one of the pieces. However, marking out and cutting the dovetail halving joint is much more difficult than a simple tee halving. The tee halving and half lap joints can be used where great strength is not required, they are also much easier to mark out and cut. 1. If you were to build a wood frame to hold heavy weights, which of the halving joints shown above would be the most suitable? Why is it the most suitable. 2. Draw a diagram to represent your chosen joint.